VICTORIA — A plan by the B.C. government to cut off ICBC auto insurance for Lamborghinis, high-end Maseratis and similar vehicles won’t save enough to prevent massive hikes to basic insurance rates, and is only a small fraction of the savings needed to end the financial crisis at the beleaguered public auto insurer. Transportation Minister Todd Stone admitted Wednesday that his move to end public insurance for super high-end luxury vehicles will only save $2.3 million in claims costs annually at the Insurance Corp. of B.C. That represents a drop in the bucket of what ICBC needs to save to avoid the worst-case scenario that it reluctantly released Wednesday, showing basic rate hikes climbing by as high as 42 per cent, compounded, over the next five years. “We are not going to allow a scenario that would provide for that level of basic rate increases to actually happen here in British Columbia,” said Stone, who promised additional reforms in coming weeks, and a push to reduce fraud, claims costs and other financial factors. 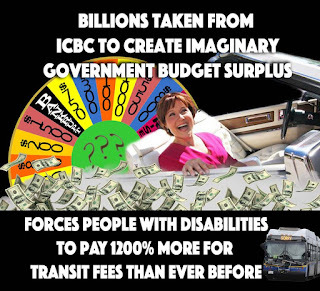 The $2.3 million in savings is dwarfed by the $472 million ICBC needed to take from its optional business this year just to cut a projected 15 per cent increase in basic insurance rates down to the 4.9 per cent cap promised by Premier Christy Clark. ICBC has had to use $1.4 billion earned by its optional insurance business to keep basic rates artificially low for the past several years, leading to questions about what effect, if any, the small savings from stopping insuring of luxury vehicles would have on ICBC’s bottom line. “It might provide a couple million of savings on an annual basis, but just as importantly, it’s a fairness question for motorists across the province,” said Stone, who portrayed the move as a way to protect middle-class ratepayers from subsidizing the province’s wealthiest citizens. NDP critic Adrian Dix said the luxury vehicle announcement was just to disguise the fact that ICBC was forced to publish Wednesday a series of damaging hypothetical rate forecasts to 2020, after losing a fight with the B.C. Utilities Commission to keep the information secret. Those scenarios (which use various assumptions around capital levels and investment returns) suggest basic rates could rise a compounded 42 per cent by 2020 if ICBC makes no progress in reducing claims costs, 25 per cent with modest progress and 16 per cent in the best case for the corporation. Dix noted ICBC hasn’t hit internal financial forecasts in several years, so it’s hard to take seriously the argument it could meet four years of its optimistic projections. Analysts have said ICBC is caught in an unsustainable cycle of politically-motivated rate caps by a B.C. Liberal government facing re-election in May, rising claims costs, and a diminishing amount of reserve capital available to earn money to artificially subsidize basic rates. He said the luxury car move would not address the challenges of ICBC but was one step toward reducing pressures on rates. ICBC will refuse to offer basic insurance on vehicles worth more than $150,000 once the law is changed next spring, said Stone. Luxury car owners will have to go to private companies to get basic insurance. ICBC will maintain its monopoly on basic insurance for everyone else. Until the law is changed, high-end drivers will find their premiums doubled to cover the skyrocketing cost of repairing their vehicles, which Stone said is now being borne by ordinary ratepayers. The change doesn’t apply to limos, trucks, motorhomes or collector vehicles. It costs up to six times as much to repair luxury cars in an accident as an ordinary vehicle, and the number of luxury vehicles on the road has risen 30 per cent to 3,000 in the past three years, said Stone. ICBC officials illustrated the situation by pointing out repairs to the bumper on a Ferrari cost $6,000 compared to $390 for a Toyota Corolla, and yet the basic insurance premiums for drivers of both vehicles were comparably priced. The number of super-high-end exotic sports cars has nearly doubled over the past six years on Metro Vancouver streets, from 1,300 vehicles in 2009 to 2,500 in 2015. That categorization is just a self-serving way of soft-soaping discrimination by providing an identifying label — although A.J. defies labels. A.J. was born in Vancouver 50 years ago. She lives with the consequences of a birth accident which rendered her deaf. She has cerebral palsy, a condition which has left her progressively more fatigued. She lives with the lingering after-effects of recurring surgeries to correct an idiopathic scoliosis, which is a lateral curvature of the spine. These differences, she says, mean she’s treated differently by the very people who profess to want to treat her like every other citizen. In spite of astonishing accomplishments, she subsists on a tiny income that’s made even smaller by provincial government clawbacks of federal benefits. The benefits are supposed to make life easier for people coping with disabilities that ensure little prospect they will ever enjoy incomes most of us take for granted. There’s discrimination and there’s discrimination. Acknowledging differences is one thing. Punishing people for their differences is entirely another. Like the Wizard of Oz, politicians are all about grand mission statements, uplifting rhetoric and high-mindedness as they promise route maps down the Golden Brick Road to the Emerald City. But behind the carefully constructed curtain of tinsel and sham, what’s at work is a con job serving the grubby principles of judgmental parsimony for the already poor. I wanted to introduce A.J. to Vancouver Sun readers because — and I admit my occasional complicity — one of the problems with writing about provincial governments, bureaucracies, policy analysis and the politicians who enable policy on the public’s behalf is how often we cloak ourselves in statistics. Statistics are a convenient way for those of us in the mainstream to distance ourselves from the realities of the actual human beings affected and marginalized by abstract decisions. That’s certainly the case for commentary about people with disabilities who are affected, in many cases hurt, by government policies that are clearly discriminatory — although government almost always denounces discrimination, even while those on the receiving end of discriminatory policy beg to differ. As a person and a mind, she attended Balmoral Hall, a school for girls in Winnipeg, then Carson Graham Secondary in Vancouver. As a high school student, her favourite subjects were geography — she was fascinated by topography and how land elevations affect weather — and mathematics. She earned a bachelor’s degree at Gallaudet University in Washington, D.C.
A.J. majored in English literature with a minor in music. It was a struggle. Her five years at university were spent in a powered wheelchair because that’s how long recovery from the spinal surgery took. She graduated in 1990. Then came the real test — finding a way to support herself despite her disabilities. Nobody, it seems, was much interested in accommodating A.J.’s differences. She went back to school at Capilano College and took business courses, then took more business training at Open Learning University. “By this time it was getting harder to speak. So, being understood was becoming more hard to do. I was getting to the point where all I could do was point and grunt. I didn’t want to be a cave woman.” Technology intervened. Now she uses her iPad to write what she wants to say. It took five years, but A.J. did find a job. She then worked for eight years, first doing data entry at the Surrey Tax Centre, later sorting mail for Canada Post, paying taxes and contributing to her Canada Pension Plan like most other working people. But fatigue and her physical condition eventually took their toll. She now subsists on combined federal and provincial disability benefits. With no clawbacks, those benefits would total $1,450 a month, $544 from CPP and $906 from B.C. But the province reduces its payment by the amount she gets from CPP and instead contributes only $342. This the province characterizes as “topping up” her CPP, although it reduces her monthly benefit to $886. A.J. has to deduct her monthly rent — she’s lucky enough to be in subsidized housing — from her monthly disability benefits, leaving her $546 a month on which to live. This is about half the average monthly income in Botswana. It’s about 15 per cent of the average monthly wage in Canada. B.C., it seems, expects people with disabilities like A.J. to live on third world incomes in one of the more expensive cities in the first world. “It is really punitive being on the B.C. disability,” she observes. “I thought, as the name suggests, disability assistance, that would be income on top of what I earn. I feel lied to. I thought it was basic income. But it comes with severe limits. Any fair-minded person might see this as discrimination directed specifically at people with disabilities because of their disabilities, regardless of government’s self-serving Orwellian definitions of clawbacks and discounted benefits as generous top-ups. The limited income means difficult choices. She passes on lunch with friends. She doesn’t go for the physiotherapy she would like because at $75 a visit the cost is too high. She cancelled cable TV and its closed caption programming because it cost too much — why haven’t our cheapskate politicians designated closed caption TV an essential service for the deaf since it’s the only effective universal emergency communication service they can easily access? Yet A.J. lives frugally so that she can save enough each month to cover tuition for one art course at Emily Carr each term. The total cost of her art courses for the year is less than Premier Christy Clark earns for one day of swanning around at photo ops. The leader of the B.C. NDP says the B.C. Liberal government is blatantly trying to buy back votes with its recent education funding announcements. John Horgan says the 11th hour timing of today’s education announcement, giving back $25-million of the $54-million the province mandated school districts find, is a bit of a head-scratcher. He says the funding announcement is not about the kids, but rather politics for the Christy Clark government. Horgan says it was also about bolstering the election chances for MLAs Coralee Oakes, Dan Ashton, and Linda Larson in Quesnel, Osoyoos, aand Penticton where the funding was announced simultaneously. Implementation of a $174-million Island-wide electronic health record system in Nanaimo Regional General Hospital — set to expand to Victoria by late 2017 — is a huge failure, say senior physicians. Doctors said the system is flawed — generating wrong dosages for the most dangerous of drugs, diminishing time for patient consultation and losing critical information and orders. The $174-million system started with a 10-year $50-million deal for software and professional services signed in 2013 with Cerner Corporation, a health information technology company headquartered in Kansas City, Missouri. Thus far, the company has been paid close to $12 million. The remaining $124 million is to be spent by Island Health for hardware, training and operating the system. The system is being used in Nanaimo’s hospital, Dufferin Place residential care centre — also in Nanaimo — and Oceanside Health Centre in Parksville. Since March 19, mobile touch-screen computer console carts have been rolling around hospital hallways. Voice-recognition dictation software immediately transcribes a doctor’s verbal notes into a patient’s electronic record, and scanners track each bar-coded patient bracelet around the hospital. But doctors complain the new technology is slow, overly complicated and inefficient. But Island Health spokeswoman Antoniette O’Keeffe said the system is safe and doing what it’s intended to do. “We are not going back to paper,” she said. By the end of the implementation, it’s expected family doctors will also be able to access patient files started in acute-care settings. Island Health is working on that component now, O’Keeffe said. Once the system is working smoothly in Nanaimo, it will be installed in the north Island and then Victoria hospitals in 12 to 18 months, O’Keeffe said. Ms. Clark was not available for comment, but her office denied that the Premier’s recent visit to Haida Gwaii was in any way meant to influence the campaign of Chief Ken Rea, who was narrowly re-elected Monday, or to assist Mr. Clark’s business deal with the band. “There’s no merit to this allegation whatsoever,” said Ben Chin, executive director of communications for Ms. Clark. But Mr. Chin said there was no link between Ms. Clark’s visit and Mr. Clark’s private business dealings. “The Premier is not aware of any relationship between Mr. Clark’s company and Old Massett Village Council,” Mr. Chin said. Mr. Chin said the Premier went to Old Massett as a “relationship building” exercise, and it appears she got caught in political crossfire. But Kimball Davidson, a candidate who was trying to unseat Mr. Rea, said the Premier’s surprise visit and the grant she announced on Nov. 26 unfairly helped his rival. Mr. Davidson, who got 117 votes to Mr. Rea’s 159, is opposed to the business deal between OMVC and Mr. Clark’s company, Broadwing Renewables Inc. and instead favours OMVC working in partnership with the Council of Haida Nation (CHN) to develop a wind farm. Mr. Davidson said the school grant is curious because Chief Matthews Elementary School is on reserve lands, and is therefore a federal responsibility, and because two expansion studies have been done in the past 10 years with federal funds. Mr. Clark said he had nothing to do with the grant and denied doing anything to get Ms. Clark to visit Old Massett. “I have trouble getting her to come for family dinners,” he said. Mr. Clark said he did help Mr. Rea make connections with government education officials. “I simply told [Mr. Rea], ‘If you have issues, here’s who you talk to,’” he said. Mr. Clark said due to his sister’s job as premier he is very sensitive to potential conflicts of interest, and he won’t get involved in business deals unless it’s through a public bidding process. “At the end of the day, when you go through a public process and you’ve been prescreened and qualified and you have the best price and you win, I don’t see how anybody can complain about that,” he said. Mr. Rea agreed Mr. Clark’s only role was that he helped make connections with the government. “I don’t know anybody at the province, so Bruce gave me a number to call,” he said. Mr. Rea said he dealt with officials in the Ministry of Education, not the Premier’s office, and Ms. Clark’s visit had nothing to do with the election. Mr. Rea said he was told by officials in Aboriginal Affairs and Northern Development Canada (formerly Indigenous and Northern Affairs Canada) that if he secured provincial funds, he could use it to leverage $2-million out of Ottawa and $2-million out of Victoria. John Disney, economic development officer for OMVC, said the council has been working with Mr. Clark for several years, hoping to develop a wind farm to replace the diesel generation that now provides electricity on northern Haida Gwaii. “That project is ready to go. It has been since 2007. The only thing that is stopping it is our own Nation, the Council of Haida Nation [CHN], won’t give us a letter of support for it. So it’s sort of internal politics,” Mr. Disney said. Peter Lantin, president of the CHN, didn’t return calls. Mr. Disney said the wind farm would cost about $10-million to develop and Broadwing Renewables Inc. would arrange the financing, bring in a firm to build the project, and then, after about five years, OMVC would buy full control. The project could not go ahead without an electricity purchasing agreement with BC Hydro. In 2012, the power corporation made a request for expressions of interest on Haida Gwaii and received 26 submissions, including one from Broadwing Renewables. BC Hydro did not pursue any of those renewable power deals at that time for cost reasons. VANCOUVER (NEWS 1130) – There is strong reaction today following controversial comments made by BC’s housing minister. In case you missed it, Rich Coleman had a questionable response when asked about criticism suggesting the provincial government isn’t doing enough about affordable housing. “I guess some people just have to get up and whine every day. You just have to look at the glass as half-full, not half-empty right? We’re getting there. There are over 2,000 units being built in the City [of Vancouver] in the last five or seven years,” he said yesterday. What he said isn’t sitting well with everyone, from potential homeowners to the Official Opposition. NDP Housing Critic David Eby feels Coleman’s comments are simply out of touch and show the Liberals don’t understand how difficult it is to buy a home here. “Keep in mind, this is the same housing minister who just last year said that house prices in Vancouver were ‘actually pretty affordable.’ And that was just days after a report finding Vancouver to be the least affordable city in entire world,” says Eby. Eby is promising to make this a sticking point as we gear up for the next provincial election less than a year from now. He admits the disconnect applies to most politicians in Victoria — including himself — who earn a wage above the average in Metro Vancouver. Eby believes the unaffordable housing market is going to be one of, if not the biggest issue in next May’s election. Laila Yuile on people, politics and life in B.C. – " The truth has no agenda."